*looks around* seems like the right place. 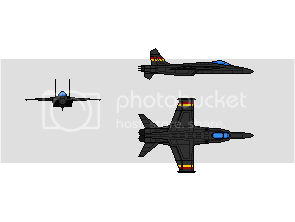 Here is my Aarcesair F-1 Shadow, an common fighter of the Saestrians Citizen's Royal Militia's navy. Hope you guys and gals like it! ...unlike EVERY other one of my drawings. Why is it so small? Let me experiment. Impressive. You've managed to make the Super Bug even uglier.